We always choose the largest, best grown plants for our internet customers. We want to you to get the same plant we would choose for ourselves. Another NEW hybrid. The last batch has already garnished AOS awards. This remake will produce some stunning results. Get yours while they are here. Limited. Using the alba form of bellatulum really increases the chances of the background being lighter which accents the pink and mahogany stripes and spots. These are really nice multi fan plants in 4&5 inch pots. We love the chocolate brown petals on this hybrid. Long and twisting. These are a NEW release of this elegant cross. Geat stripes, rich color and gracefully twisting petals make this one of those plants we think everybody should have. 1-2 years to bloom. These are limited and will not last long. LOOOONG petals on this hybrid. These are nice multi fan plants NBS about a year from blooming. ( primulinum X Saint Swithin ) Golden yellow flowers sporting broad undulating petals with lots of honey brown spots and hairs. 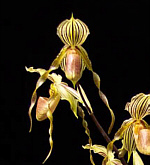 A rich golden honey pouch and striped dorsal sepal finish out this great multi floral Paph. Flowers reach to 8". Highly recommended. 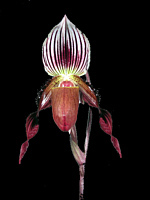 This new hybrid will have wide elongated petals. Very similar in appearance to Saint Swithin but with darker petals. We look forward to seeing this interesting multi-floral. ( sukhakulii X rothschildianum ) Another great rothschildianum hubrid this time using sukhakulii which makes for great wide spotted petals. 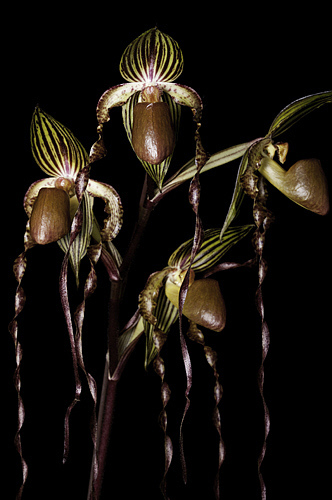 Plants throw 2-3 flowers per stem. Limited offering. 1 or 2 large flowers up to 5 inch natural spread are well held above the attractive mottled leaf foliage. Plants are vigorous growers. A salient addition to anyones collection. ( liemainum X henryanum ) Really cute! Vibrant green flowers with rich burgundy wine colored petals and spots on the petals and sepals.Rich pinky / burgaundy pouch. 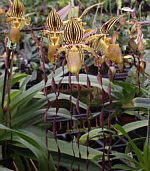 Flowers are approximately 2 1/2 inches and are well held above the foliage. These are great growers. Multiple growths in every pot. Light chartruce flowers with dark mahogany viening .A burnt orange lip really complements this seldom seen primary hybrid. 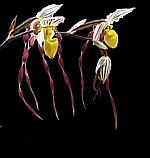 Normally bearing 2 to3 flowers per stem, the plant will bloom easier if given a dry rest period in the winter. ( lowii X rothschildianum ) Graceful, wide flowers many to a stem. Artfull presentation and strong color. Some pinky mauve on the tips of the petals have occured on some of this grex. Nice plants. ( Io X rothschildianum ) The `Mars' clone of this hybrid is over 100 years old. 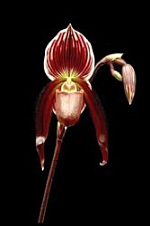 First awarded an AM by the RHS in 1896. Get yourself a piece of history here. Another great hybrid using praestans crossed to a Maudiae type gives us lots of color and twisting petals. Many have "Flame" patterns in the dorsal sepal. 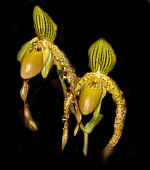 They produce 1 to 3 flowers to a stem, usually 2. Unusual hybrid not often seen available for sale. Yellow green flowers with some twist to the petals and the definitive stripe in the middle of the dorsal sepal. These seed grown plants will vary depending on which parent is dominant. ( armeniacum `K.S.' 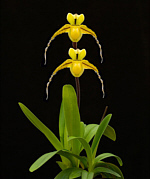 X rothschildianum `Excelsior' ) A remake of this stunning cross using select parents. Large golden yellow flowers with mahogany red stripes and spots. Averaging 2 to 3 flowers per stem. These flowers show the influence of both parents. Striking broad petals with lots of spots, warts and color from sukhikulii and multi-floral tendencies and longer petals from rothschildianum. This is another hybrid that seems to be hard to find, but we have some very nice multi-fan plants for sale. (phillippinese "Alfred" AM/AOS) Elongated, broad petals with dark stripes & spots. Pouches are solid color, light to dark mahogany. Broad dorsal's with a light background & dark vertical stripes. Multifloral. Glossy pink flowers on short spikes. Plants grow good throwing 2 to 3 fans a year. 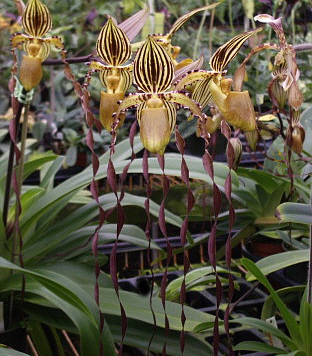 Flowers are broad, well shaped and nicely held above the plant. Color and shape in this interesting hybrid. The charlesworthii ( Photo ) adds a 3 pointed crown-like dorsal sepal and the lawrenceanum adds stripes, deepens color on the pouch and overall intensifies the color of the progeny. 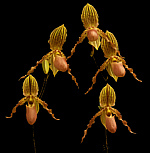 Our clone of this hybrid is an excellent, smaller flower, multi-floral with tight twisted caramel colored petals. The praestans really shines through on this one. This remake was done with select parents. 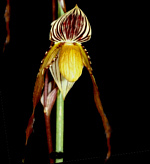 Many flowers with long twisting, dark mahogany petals with strong mahogany stripes on dorsal sepal. These are large, well grown, blooming size plants. One of our favorite species. Tall spikes of striking mahogany, yellow and white flowers. 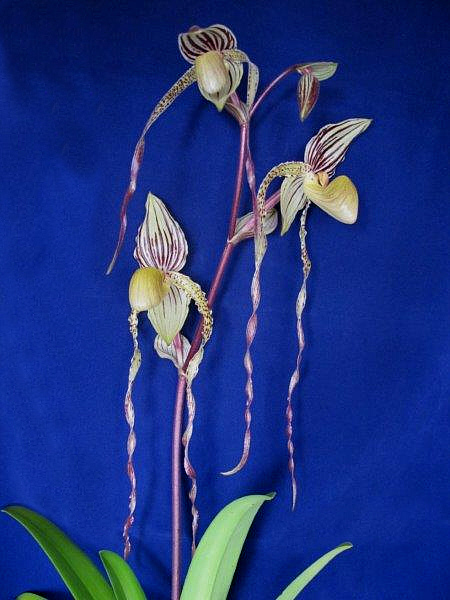 Graceful twisting petals give this species a lot of appeal. These are great! Huge spikes with graceful down turned petals. Large well grown plants from our personal collection. 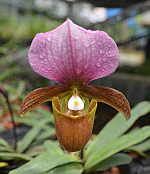 Combining Paph. 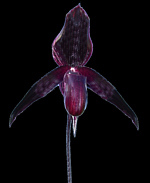 kolopakingii with the long petaled praestans (glanduliferum ) is a great idea. kolopakingii needs to get huge to bloom but praestans does not. We have one spiking in a 5 inch pot right now. 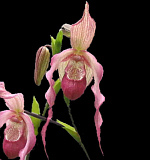 This hybrid puts on lots of flowers with elongated twisty petals. Get yours not because these are linited. Extremely showy and easy to grow. Flowers are large, around 6" long, and simply beautiful. We grow these in "wet pots" with built in water retention at the bottom of the pot.